(L-R) NATO Secretary General Anders Fogh Rasmussen, Canadian defense minister Peter Gordon MacKay, US Defense Secretary Leon Panetta, Advisor, speak with Afghanistan's Defence Minister, General Abdul Rahim Wardak on the second day of talks on February 3, 2012. On March 17, 2012 David Pugliese of The Vancouver Sun reported that "Canadian Forces hope to save $90 million a year by pulling out of NATO programs operating unmanned aerial vehicles as well as airborne early warning planes. Defence Minister Peter MacKay said it will free up 142 Canadians assigned to NATO for new jobs." "The shutdown of Canada’s contribution to NATO’s airborne warning aircraft, known as AWACS, will save about $50 million a year. Another $40 million a year will be saved as a result of Canada’s withdrawal from NATO’s Alliance Ground Surveillance Program. Canada has been involved in NATO’s AWACS program for more than 25 years and the aircraft were seen as key to the alliance’s success during the recent war in Libya." "U.S. unmanned aerial vehicles, or UAVs as they are known in military parlance, were also used to gather intelligence information during the Libyan conflict. NATO wants to ease the strain on the U.S. UAVs by having a pool of Global Hawk unmanned aerial vehicles at the alliance’s disposal. Canada’s pull out from the UAV program will be done by the end of April, the Defence Department confirmed." I think this is some amazing technology and it's too bad that we are ending our contribution with NATO and the Countries we have previously had partnerships with. Aung San Suu Kyi is a Burmese opposition politician and the General Secretary of the National League for Democracy. She was under house arrest from July 1989 until her recent release in November of 2010. She is featured above speaking to a group of Carleton University students about democracy in Burma. In a CBC article, published March 8, 2012: Baird learns of possible Burma vote rigging; the Canadian government announced that it will be monitoring Burma's elections next month. Aung San Suu Kyi, democratic icon and Nobel Peace laureate, greeted Minister Baird at her home in Rangoon where she has been under house arrest for the last 23 years for opposing the ruling military junta. Baird came bearing the gift of honorary Canadian citizenship for Suu Kyi. Suu Kyi used the meeting to express concerns about vote rigging in Burma. Suu Kyi requested that Canadian monitors pay close attention to the elections to ensure more legitimacy for the electoral process. Baird said that he would be "thrilled to lift the Canadian sanctions against the current government." Baird said of the Burmese elections that "they won't be perfect elections, but they will be fair, open and transparent ... The whole world will be watching, as will Canada." "In a way, Baird is making history," reported the CBC's Adrienne Arsenault. 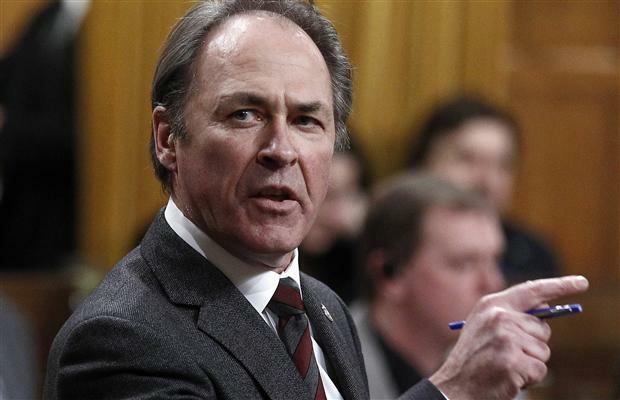 "He's the first Canadian foreign affairs minister to ever set foot in Burma. However, in terms of global politicians, he joins a parade of people who have recently come through Burma over the last several months. Many are asking, is this reform for real, or reform for the sake of attracting the attention of international investment?" Fraudulent pre-recorded phone calls were made during the May Federal Election in Guelph ridings. The use of voter-suppression campaigns and push-polling are used with more frequency south of the border in the United States. The Conservative Party has been accused by the Opposition of using robocalls that pose as Liberal Party members and misdirect voters to the wrong polling stations. David Soberman, Canadian National Chair in Strategic marketing at the University of Toronto predicts that changes will occur within the Canadian election process to prevent this occurring again in the future. Soberman said that "if you're Elections Canada, you think, 'What is it that we can do to ensure this doesn't happen again ... considering it's never happened here before." NDP Opposition MP Pat Martin said the Tories appear to have borrowed their tactics from gangsters and criminals. Martin is pictured above during Question Period February 28, 2012. An article by Michelle Zilio of the Ottawa Citizen stated that the robocalls are a shock to the system of Canadian democracy. Joseph Cummins, a U.S. author of electoral 'dirty tricks' said that "Misdirecting voters to a different place is a pretty serious dirty trick because you're disenfranchising them and taking away their right to have a voice in their government." Another Ottawa Citizen article by Jeff Davis stated that Elections Canada was falling down on electoral fraud. The article goes on to describe the Harper Government's reaction to the scandal in the House of Commons during Tuesday's question period. RackNine, a Tory-linked firm has been connected with the scandal. Among the activities flagged by Elections Canada in the 2011 Federal Election are unsolicited telephone calls, automated telephone messages and crank calls. Former Chief Electoral Officer Jean-Pierre Kingsley said "judges might crack down on any attempts at voter suppression ... We've never seen anything on this scale. Since we're attacking constitutional rights of individual electors, the judge could expand the maximum penalty and impose a jail sentence." A spokesperson for Elections Canada has publicly stated that "The Commissioner of Elections Canada will not confirm or deny that a complaint has been received or that an investigation is underway"
One of the countries caught up in the Arab Spring is the kingdom of Bahrain. The Bahraini uprising began in Feb. 14, 2011 and has since been crushed by the Monarchy of King Hamad and the Gulf Cooperation Council. 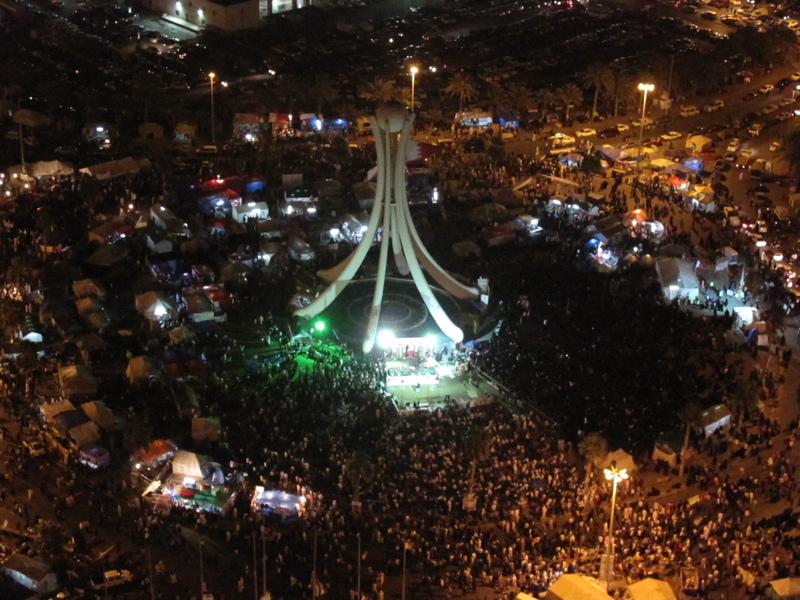 To the right is an image of Pearl Roundabout, the Tiananmen Square of Bahrain and the location of many public protests. What began as protest for reform has since been described by the Bahraini Opposition as a call for: the abdication of King Hamad, a Constitutional Monarchy, deportation of foreign armed groups including mercenaries and Western and Gulf State armies, a new Constitution, an end to economic and human rights violations, elections and equality for Shias (the Country's majority sectarian group; the Country is governed by the Sunni minority). Bellow is an Al Jazeera English Documentary: Bahrain Shouting in the Dark which I believe to be a fair and accurate depiction of the conflict that exists in Bahrain today. Needless to say, the opposition has not been very successfull in achieving their goals. The Dictatorship of King Hamad continues to this day, he is perportedly one of the longest serving heads of state currently in power. A large contingent of Saudi and Pakinstani troops occupy Bahrain on behalf of the Gulf Coorperation Council and at explict request of the Bahrain Government. The protests were crushed, Pearl Roundabout raised to the ground and now the country is in a state of military occupation with widespread reports of torture, human rights abuses, and government censorship. Also Bahrain has been home to the U.S. Fifth Fleet, the Bahrain Government has been a strategic ally in the American lead War on Terror and continues to be. Bahrain is said to represent the first counter revolution against the democratic uprisings of the Arab Spring. 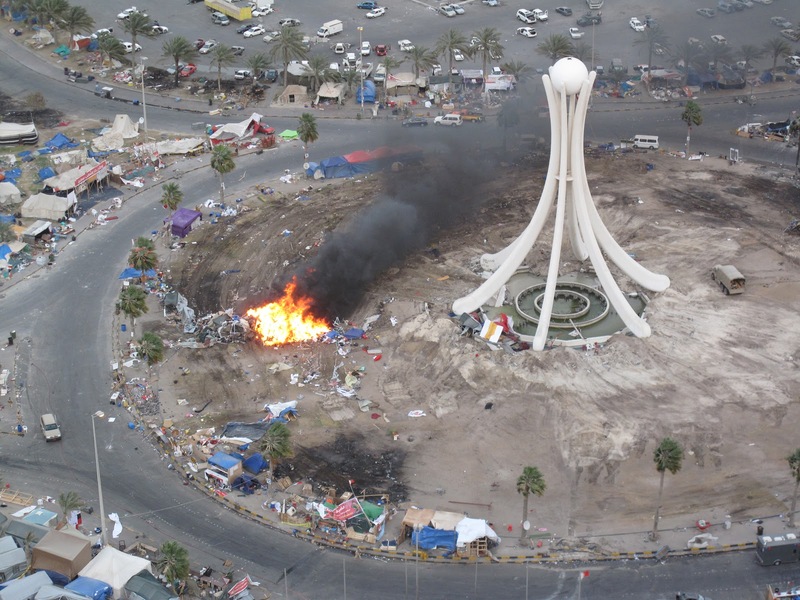 If you enjoyed reading this post you may also like a blog post by Brad Richardson on the year anniversary of the Bahrain uprising. The blog post title is: Bahrain Protesters Rally Ahead of Anniversary. An independent press is essential to the functioning of a democracy. The ability of media to criticize the government and public officials is something worth protecting. A free and independent press also allows for civil society to have a platform and a vehicle for debate and dissent. The Press Freedom Index 2011/2012 is an excellent resource to begin researching press freedoms. Hey at least we made the top 10, not bad, but to be fair we tied Denmark for 10th. 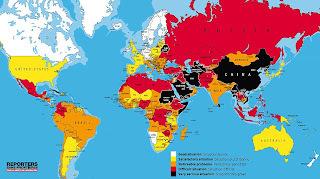 Something interesting I found was that recent protests in the Arab world has caused Countries caught up in the Arab Spring to have a lower press freedom score. Protest movements in European Countries have also caused lower press freedom scores for those countries. 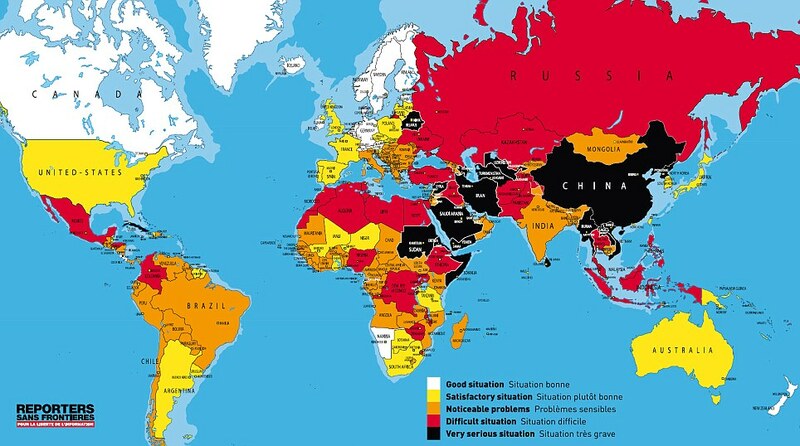 It would appear as though there is a correlation between war and public protest and low press freedom index scores. The United States ranked 47th. These low results from the United States are attributed to the Occupy protests and current wars in the Middle East. The events that are taking place in Syria are an affront to democracy and human rights. How did things escalate so far? Since Dec. 18 2010 a revolutionary wave of demonstrations and protests have occurred in middle eastern states. The Arab Spring has created revolutions in Tunisia and then Egypt, in Libya and in Bahrain. The Arab Spring has spread to Morocco, Yemen, and Syria. Each revolution has its own nuances and particular grievances but something they share in common is the widespread use of cell phones and modern communications technologies over the internet to capture the uprisings. The Syrian revolution began when a group of teenage boys spray painted anti-government graffiti on their school. The Syrian police arrested and tortured the school children leading to public protests and more violence. 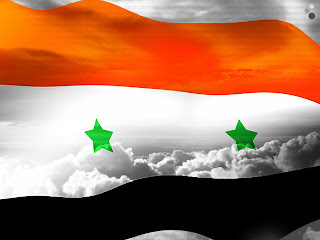 The Syrian government uses extreme violence to stop what they say are terrorists and criminals but many innocent Syrians have been killed in the ensuing conflict. I found some interesting documentaries on news.linktv.org that describe the situation for civilians in Syria. Inside Story: Has Syria Been Given a License to Kill? Both of the links above will take you to footage from Aljazeera English. I once went to school with a fellow from Syria. We talked about politics on occasion and I can remember asking him what his favourite thing about Canada was. He told me it was the freedom and I laughed a little, I guess I take it for granted, I didn't really understand. My Syrian classmate said that he enjoyed jogging around campus without having to have a security pass. He told me that he didn't have the freedom to move around much back home in Syria. After watching the above documentaries I think I can appreciate more of what my colleague from Syria was trying to impress upon me.